There are few elements more important than time when dealing with a cyber incident. In today’s threat environment, one study indicated the average length of time before an intrusion was detected is a staggering 98 days. Once found, over 70% of organizations reported remediating the incident within a full week. The difference between responding rapidly and a slow response may mean the difference between a minor security event or a catastrophic business crisis. Aerstone’s team of security professionals provides rapid incident response across the United States and around the globe. Major international airports near our offices in Boulder, Colorado, and Washington, DC provide immediate access to flights anywhere in the world and remote assistance is available immediately in most instances. Using our AerStrike™ devices, Aerstone can overnight deliver a ready solution, enabling our team to securely work towards remediating your security issue as though they were on-site. These incident response steps are customized to fit the client’s operating environment, risk posture, and business environment. The Aerstone approach is completely transparent, meaning the client’s representatives are fully engaged in the response process. Aerstone uses the same tools and techniques as law enforcement and the federal government to collect, preserve, and analyze evidence on computers, mobile devices, and digital media. Strict collection and handling protocols ensure accurate and secure data capture. Certified forensic experts personally analyze all evidence to determine the specifics of your case and produce a detailed report with findings explained in plain English. Additional details are included to satisfy the needs of third party experts and law enforcement. Aerstone has developed a customized dual-homed VPN-enabled pentesting device, which comes loaded with our full suite of penetration testing software. 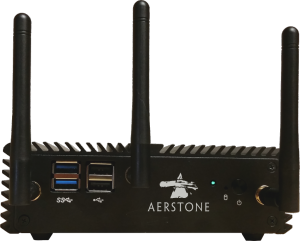 This device, which may be deployed to a customer’s network to support remote testing engagements, allows Aerstone's testers to securely test your network without having to be physically present on-site. AerStrike™ supports both on-device and network pass-through testing, as well as both wired and wireless connectivity. For more information click here, or download the product sheet.